Marburg is located between the metropolis of Frankfurt and Kassel, home of the documenta exhibition of contemporary art. It has an historical old town and a university dating back almost 500 years. The town on the River Lahn and the surrounding area have a lot to offer, which we will show you! Did you know that a quarter of all Marburg inhabitants study at Philipp University like you do? That makes it easier for you to settle in. At the beginning of each semester, we invite you to a welcome meeting so that you as DAAD scholarship holders can get to know one another right at the beginning of your studies. We meet in a traditional café offering a panoramic view high above the River Lahn in Marburg old town with its many beautiful half-timbered houses. What else is on the programme? 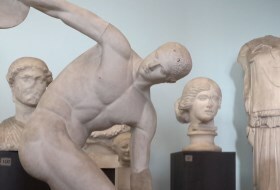 For example, we visit the big collection of sculptures in the Archaeology Department at the University of Marburg to marvel at the plaster casts of antique statues. We also make trips to the nearby area and further afield: for example, to Licher Privatbrauerei, a private brewery located in Lich, or to Kassel, Mainz and Frankfurt, where we visit the famous zoo or go to a Christmas concert in the old opera house. One thing is for sure: we always have fun together!